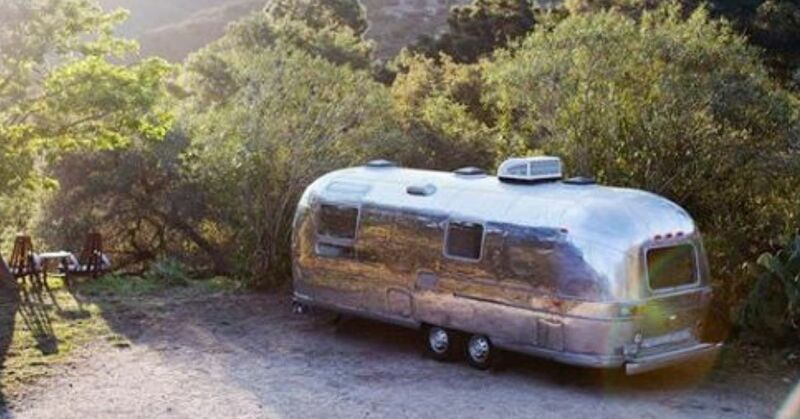 Led by the desire to live simply and more efficiently, Rachel and Virgil decided to live full time in their renovated 1972 Airstream, parked for now at an RV park in Southern California. The perfect space for a family of two (three if you count the couple’s rescue pooch, Jovie), the couple gutted the interior down to the bones to create the open, earthy aesthetic they enjoy today. Virgil, an environmental engineer, and Rachel, an interior designer, became a dream renovation team. Ruthless priorities were needed to allocate the precious 180 square feet of space. The couple decided to allocate only 3 by 4 feet for the bathroom, preferring instead to create a sleeping nook in the back of the camper that could accommodate a queen-size mattress. The couple loves to cook together – both come from Italian families – so the kitchen became the main priority. The resulting shared kitchen/dining space boasts expansive counter space as well as a two-burner electric cooktop, full-size sink, energy-efficient refrigerator and a large convection oven. The floor-to-ceiling pantry stores dry goods, and large drawers house kitchen appliances, glassware and dishes. Olive-hued cabinetry and concrete countertops with a feather finish set the tone for the natural aesthetic throughout the home, and a brass faucet and patina knobs add layers of warmth and texture. The dinette was crafted from a walnut table, accented by plush gray cushions, roomy enough to share a meal with a few close friends. Additionally, the table telescopes down, creating a large sofa or spare bed. Under-bed storage adds sneaky space in the sleeping nook. The couple chose a matching olive finish for their dresser to coordinate with the kitchen cabinetry, complemented by a soft gray linen duvet. Two walnut shelves flank the bed, in a finish matching the dining table. The small-but-mighty bathroom includes all of the essentials. White hexagon with black penny tile keeps the palette neutral, complemented by a reclaimed wood countertop. The white vessel sink features bronze hardware, which offers depth along with accents of greenery.